I am searching to find an answer to my conundrum. There are lot’s of people who feel comfortable walking their dog off leash, I myself over the years have allowed a few of our dogs to walk along a trail with us untethered. My girls were my shadows, they wouldn’t leave my side and if we encountered another dog they were so nervous they would hide behind my legs for protection. When hiking with Lucas, I rarely ever let him loose, it is not that I feel that he would take off and I would never see him again, for me it is I am not sure how he will react to other dogs that he encounters that are unrestrained, for his protection I keep him safe and secured. The other day I was in the park with a pair of my clients, both of the dogs are on the small side, and the one can be aggressive in situations when she is uncertain. As we rounded the corner in one of the parks I like to walk in I realized there was a cute dog, similar in stature running around sniffing with no leash on. I quickly tried to move out of the way and as I did so and his pooch be lined for us. I warned the young man that one of the dogs could be aggressive, I think he didn’t really believe me, and the result was the dogs got into a tousle. The long and the short of it, as I was trying to make sure the situation didn’t go poorly, my clients dog got out of her harness and I had to drop on her to prevent her from getting away and nearly let go of the lead of the other dog. My heart was racing and I hurt my knee and back. 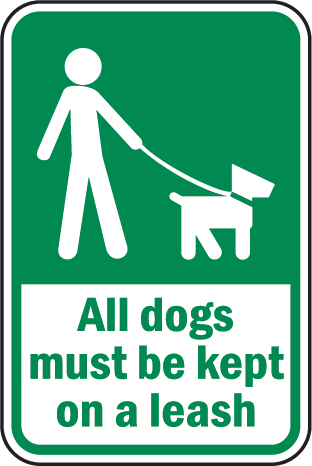 The thing I struggle with, I appreciate people feeling they know their pets and their confidence in letting them run free, but if you are in a public park, where it clearly states that all dogs must be leashed then you should have your animal restrained! Thankfully the young man’s dog wasn’t injured, I was grateful that my clients were unscathed and after a few visits to the Chiropractor I shall be good as new. What irritated me though, later that afternoon when I was walking another set of dogs, I felt forced to walk along the streets in the heat, avoiding the cool shady paths in the park, for the simple reason that I knew there would be too many dogs off lead at that time. Everyone should be able to use the park, if we all follow the guidelines and keep our pets on a leash it helps the public enjoy their park experience, cyclists, children, and people who are out walking. Maybe I sound like a jerk, or perhaps a person who needs to take some obedience classes, but none of those are the case…I don’t take my girl friend to a place where dogs are allowed to be running a muck, as that’s not her scene, I take her to a public park where she should be able to enjoy the shaded gravel paths and I can safely help her navigate her way while she is able to release some energy and enjoy the fresh air, because as the sign clearly states, “YOUR DOG MUST BE ON A LEASH”.